Ellen Jo Roberts is an artist and photo enthusiast who lives in Clarkdale, Arizona. She spends her work days as a group coordinator for Verde Canyon Railroad. Ellen Jo is a part of the Arizona Office of Tourism’s Guest Blogger Program. Desert wildflowers are tenacious survivors, thriving under conditions that would wilt most species from other regions. Motivated by the smallest amount of rain, wild Arizona blooms spring forth from dry rocky soils, sprout from stalks up to 12 feet in the air and cling to impossible cliffs. They decorate spiky shrubs, cacti, roadsides and dry sandy washes, and carpet the high desert with color and fragrance. They provide nourishment to wildlife with their pollen, fruits and seeds. My favorite Arizona wildflower? It's so hard to pick a favorite (pun intended!) So rather than choose just one, I thought I'd share with you a bouquet of my top ten. Prairie Sunflowers (Helianthus petiolaris): Late summer these flowers decorate the state with these tall golden blooms swaying in the breeze. Penstemon: Seen in electric colors of red (Firecracker, Penstemon eatonii) and hot pink (Parry's, Penstemon parryi) varieties, these prairie plants thrive throughout the dry, sunny West and are frequently seen blanketing roadsides and railroad tracks. Picture on the right. 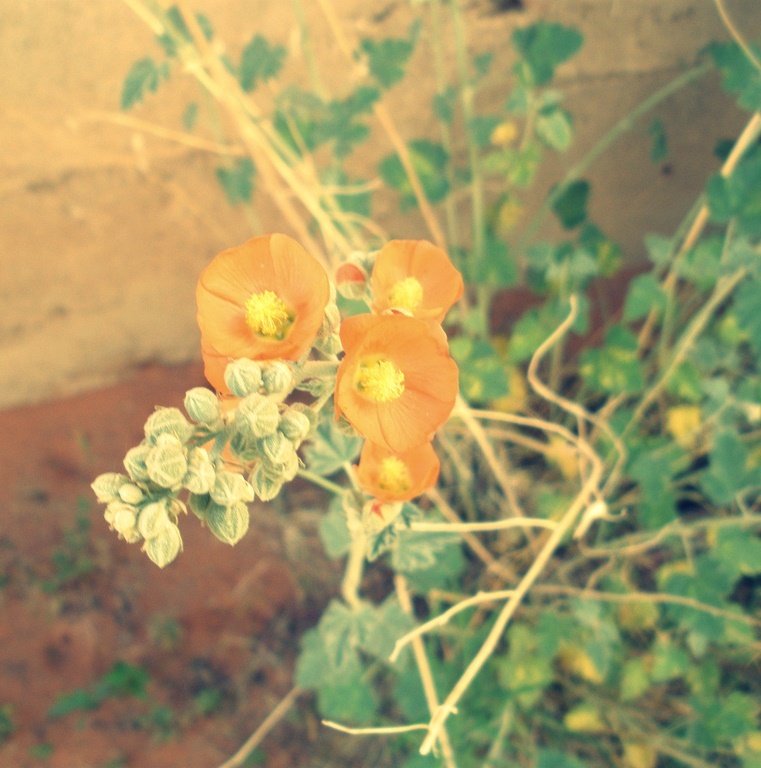 Globemallow (Sphaeralcea ambigua): This is my husband's favorite. Any time a volunteer takes root in our Clarkdale yard he cultivates it, waters it and shields it from the weed whacker. Globular orange blooms dance above handsome gray-green foliage. It's also a related to Chocolate, so what's not to love? Pictured on the left. Desert Marigold (Baileya multiradiata): For many Arizonans this cousin of the Aster is a beloved favorite. It resembles an Andy Warhol Pop Art with their blossoms hovering high above its low-growing leafage like a bright yellow flying saucers. Saguaro (Carnegiea gigantea): Around Memorial Day each year, the majestic Saguaro of the Sonoran Desert bursts forth with thick white petals, cresting each arm like crowns. Prickly Pear (Genus opuntia): The prickly pear's fruit is called the tuna and turns fantastic shades of purple though its ripening process. The fruit is a great source of nourishment to Arizona wildlife, though humans also have cultivated a fondness of the fruit. Can you say prickly pear margarita? Pictured at the top. 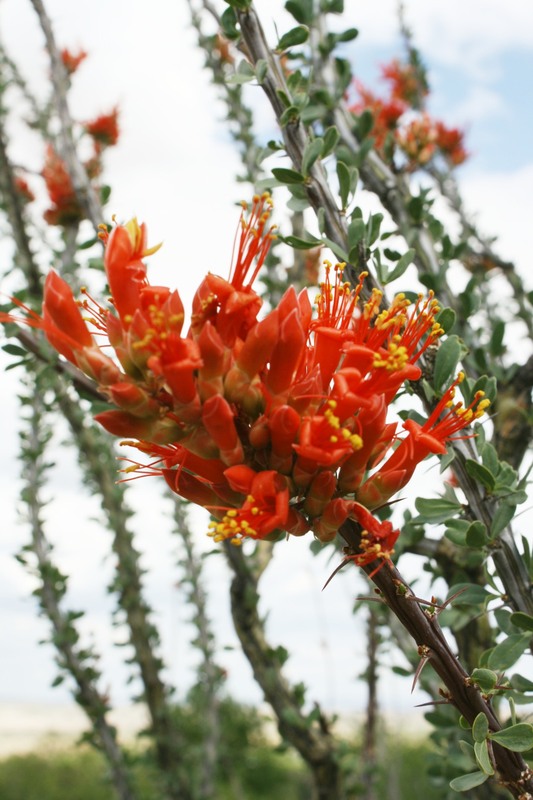 Ocotillo (Fouquieria splendens): Much of the year Ocotillo can look like a spiky bundle of dry sticks, conserving its energy until there is sufficient rainfall to spur on a growth of tiny, teardrop-shaped leaves. The top of each skinny branch is decorated with a bright, red-orange cluster of flowers. 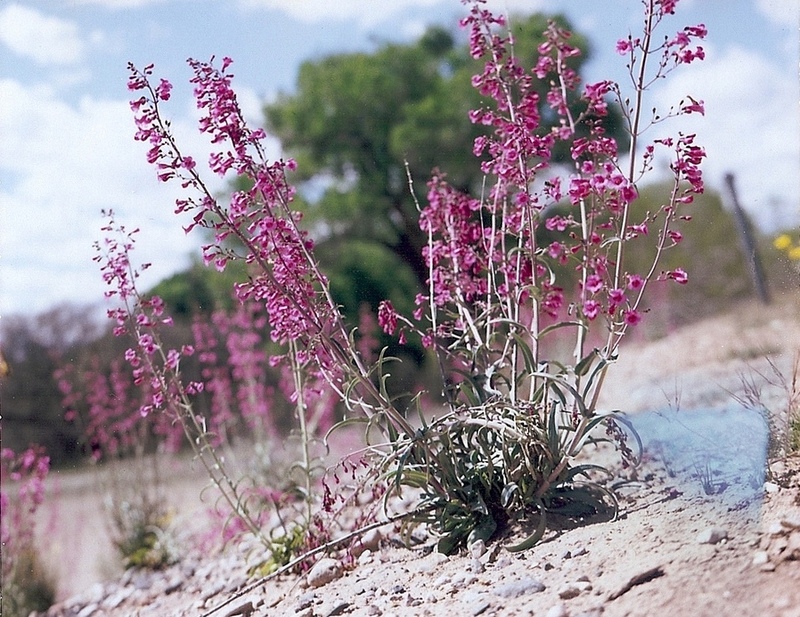 It's one of the most interesting desert plants, and very special to catch in bloom. Pictured on the right. Sacred Datura (Datura Meteloides): This flower’s huge, trumpet-like flowers, open during the cool of night and closed in the heat of day, have been immortalized in the Southwestern paintings of artist Georgia O'Keefe. It's related to the tomato, but is toxic like the other poisonous members of the nightshade family. Yucca: There are two types of yucca that commonly grow in Arizona; one is known as "Banana Yucca" (Yucca buccata) for the green banana-shaped fruits it produces. The other, more elegant variety is called "Soaptree" (Yucca elata, which actually has its own Arizona subspecies, Verdiensis). Yucca is one of my favorite wild blooms of the state. Yucca flowers sprout up like sentinels throughout rocky, high desert hills and valleys, and its waxy white blooms are a favorite of hummingbirds and moths as well as shutterbugs like me. Pictured on the left. Agave (Agavi americana): Yucca’s cousin Agave is also sometimes called the "Century Plant," under the mistaken notion it took 100 years to bloom. Seeing an agave bloom is very special, because you're actually seeing the end of the plant's long life. Its entire existence is dedicated to this final goal ̶̶̶̶̶̶̶̶̶̶ the raising of its towering stalk and flower buds. The heart of the Mexican Blue Weber variety of agave is roasted and distilled into tequila and mescal. After blooming, the plant soon withers into a hard husk and miniature offspring agaves may soon be seen surrounding it. 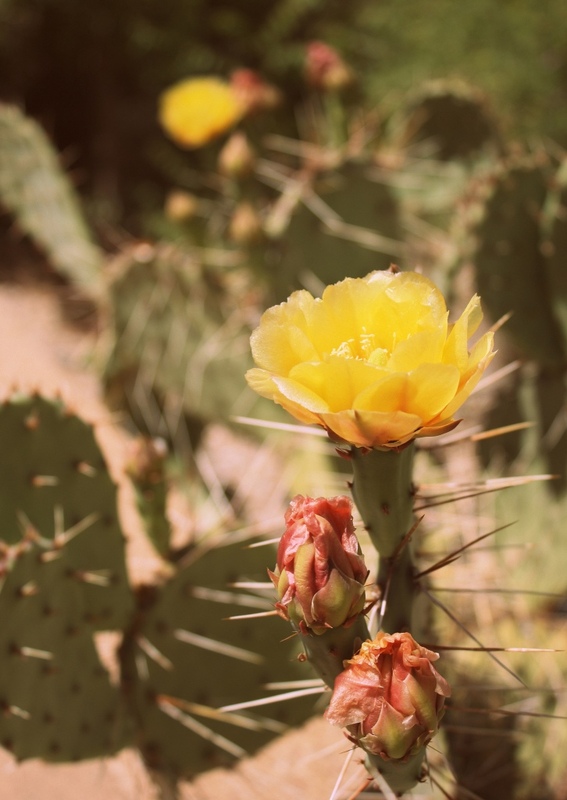 Due to Arizona's vast ecosystems and elevations, you might catch the same blooms in action in different locations during different times of the year. Enjoy the sights and scents of Arizona in bloom!